This is a superb hand signed 12" x 8" Colour photograph by the late English Television Presenter and all round entertainer. Sir Bruce Joseph Forsyth-Johnson CBE (22 February 1928 – 18 August 2017) was an English television presenter and entertainer whose career spanned more than 75 years. 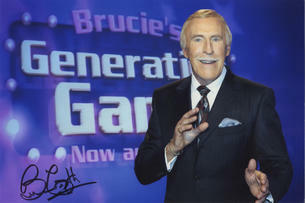 In 2012, Guinness World Records recognised Forsyth as having the longest television career for a male entertainer. Forsyth came to national attention from the mid-1950s through the ITV series Sunday Night at the London Palladium. He went on to host several game shows, including The Generation Game, Play Your Cards Right, The Price Is Right and You Bet!. He co-presented Strictly Come Dancing from 2004 to 2013.